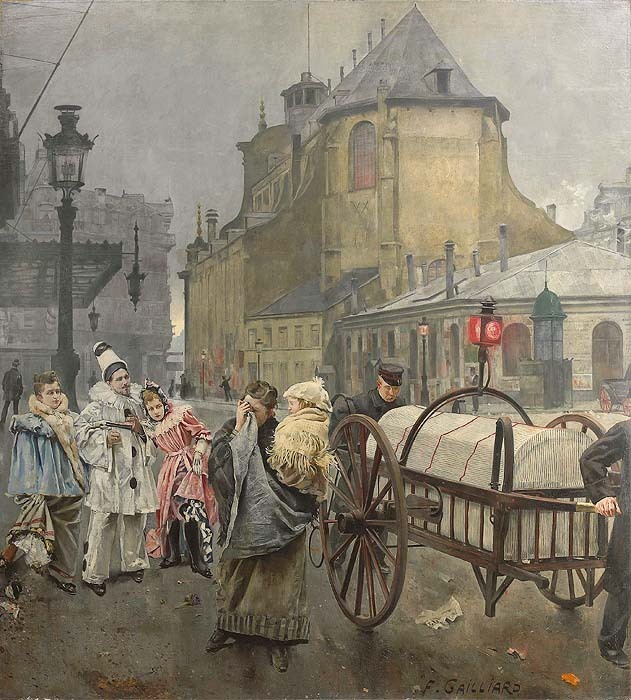 Franz (Bernard) Gailliard (Belgian, 1861-1932) "La Place Sainte Gudule à Bruxelles Après Le Carnaval" A Fine and Large Oil on Canvas depicting a street scene in late 19th Century Brussels - La Place Sainte Gudule - after the Carnaval. Unframed. Signed: F. GAILLIARD (l/r). Circa: 1890. Franz Gailliard was a Belgian Neo-Impressionnist and Luminist painter of figures, portraits, landscapes and beach scenes. He was also a reporter, watercolourist and draughtsman for French, English and Belgian lifestyle magazines and newspapers such as the French Le Patriote illustré, Belgian Le Petit Bleu and English London Illustrated News. He received his artistic education at the Academy of Brussels under the tutorship of Jean Portaels, Joseph Stallaert and François Bossuet. Gailliard also studied at the Brussels Academy of Beaux-Arts and in Paris under the supervision of Jean-Léon Gérôme (French, 1824–1904) and followed class together with his contemporaries James Ensor, Léon Frédéric and Fernand Khnopff. He met up with the renowned American painter James Whistler in 1887 and showed him around Brussels. He was the first artist to introduce the "dripping" method in 1891. After having painting in a realist and traditional style, he got influenced by the Impressionist French School, and headed toward a "luministe-divisionniste" technique in his latest period. He exhibited at the Brussels Salon, and at the Salon des Artistes Français in Paris from 1882 to 1891, as well as in Venice and Düsseldorf. Gailliard exhibited his oeuvre at the "Cercle Artistique et Littéraire" in Brussels in 1910 and 1913. He became eventually director at the Academy of Sint-Gillis where his son Jean-Jacques Gailliard took class in order to also become painter. A retrospective was held in is honour is 1957 in Sint-Gillis. Even though he was influenced by the Art Deco aesthetics after the First War, he never stopped studying and experimenting with light. Gailliard exhibied at The Esposizione Internazionale d'Arte della Città di Venezia (Venice) in 1909 and at La Biennale di Venezia, (Venice) in 1907. He also exhibited at Le Musée d'Ixelles, Brussels. Gailliard died in Brussels on February 16, 1932. Biography information of Gailliard was obtained from Galerie Ary Jan in Paris. Please click here to learn more about Mr. Severin Wunderman.